Hugh Levinson tells the story of the lobotomy craze of the 1940s and 50s and asks what the procedure's popularity says about the nature of scientific progress - or otherwise. 2011 marks a 75th anniversary that many would prefer to forget: of the first lobotomy in the US. It was performed by an ambitious young American neurologist called Walter Freeman. Over his career, Freeman went on to perform perhaps 3,000 lobotomies, on both adults and later on children. He often performed 10 procedures or more a day. Perhaps 40,000 patients in the US were lobotomised during the heyday of the operation - and an estimated 17,000 more in the UK. 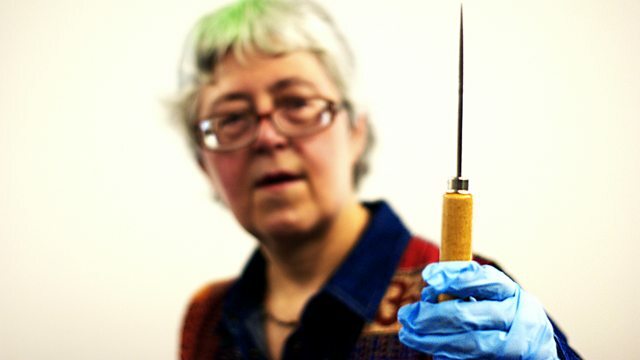 This programme tells the story of three key figures in the strange history of lobotomy - and for the first time explores the popularity of lobotomy in the UK in detail. The story starts in 1935 with a Portuguese doctor called Egas Moniz, who pioneered a radical surgical procedure on the brain. Moniz was a remarkably distinguished figure, a diplomat as well as a doctor, who had invented the technique of cerebral angiography which is still used today. With very little evidence, he speculated that cutting the links between the frontal lobes and the rest of the brain would relieve symptoms of mental disorder. His results were seized on with enthusiasm the following year by Freeman, the grandson of one of the US's most famous surgeons. Freeman was a relentless self-publicist and managed to convince many of the efficacy of his procedure. Freeman's promotion of lobotomy as a cure for mental illness was instrumental in Moniz receiving the Nobel Prize for medicine. The operation was also taken up by the most celebrated British neurosurgeon of the time, Sir Wylie McKissock. Like Freeman, he travelled the country, performing numerous lobotomies in single sessions. For this programme, Hugh Levinson interviews McKissock's former colleagues and hears in detail about how he performed several thousand lobotomies, or leucotomies as they were known in the UK. The operations were successful in subduing disturbed patients, usually with immediate positive results, which sometimes persisted. Freeman argued that this was better than letting mentally ill patients rot away for decades in squalid institutions, untreated and unattended. However, further monitoring showed very mixed results. While a significant number of patients with affective disorders seemed to become better, a large proportion were unaffected or got worse. Many patients reverted to a child-like state. A significant proportion died as a direct result of the procedure. In the 1940s, Freeman pushed on, devising a faster and cheaper procedure. He hammered an icepick (originally taken from his home fridge) through the top of each eye socket, directly into the skull. He then swept the icepick from side to side, destroying the connections to the frontal lobes. Other surgeons were horrified by the random nature of the operation. He recorded with satisfaction in his diary when attending doctors ended up vomiting or fainting. His closest aide refused to participate. By the late 1950s the lobotomy craze was over, and only a very few continued to be performed in special cases. In the late 1960s, Freeman was banned from operating. The stories of Moniz, Freeman and McKissock - all commanding and dynamic figures - raise profound questions about our ideas both of mental health and science. Is a patient "cured" just because he becomes subdued? And how come the lobotomy became so popular despite the lack of evidence of its efficacy - and the rapid dissemination of evidence of its potential for harm? To what extent is science independent of powerful personalities, economic considerations and media pressure?